Course Etiquette - How Much Do You Think About It? It’s a common consensus in the disc golf community that any fellow golfer you meet, no matter how or where, is generally a cool human being. Maybe you don’t have the same taste in music and perhaps you throw different brands of plastic, but overall, you have mutual respect for one another. While this is typically true when individuals interact with each other, what often doesn’t carry the same weight is how we treat the courses we play on. Yes, most of us will do what we can to leave a disc golf course in the same condition as when we arrived, and an exceptional few volunteer long hours to improve and beautify the land we play on. 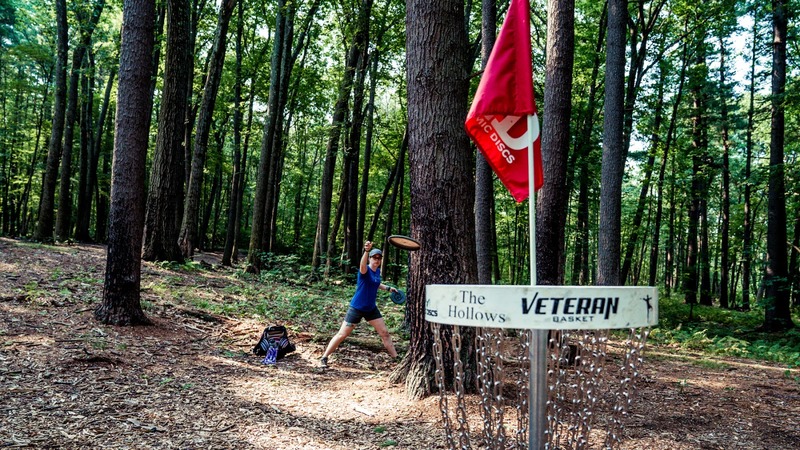 Yet sadly some disc golfers don’t have quite the understanding of course etiquette that perhaps they should, so let’s review some of the more well-known rules that players of our sport hold dear to their hearts. It doesn’t matter if you’re playing in a public park, on private land, or in a secluded area away from most - any disc golf course you play on should show no trace that you were even there. Things like disposing of trash properly are a given, and those who go the extra mile sometimes bring trash bags with them and help clean up the mess left by others as they play. Most disc golf players carry a Sharpie in their bag, but that doesn’t mean you have to use it during a casual round to deface property. All too often you’ll see a bench at each tee box that has “disc charger” written on it with an outline of someone’s disc. There’s nothing more discouraging than having a deep respect for the game and seeing this out on a course. The same idea goes for drawing on tee signs and baskets. We know it’s exciting to get an ace, but all too often baskets are scribbled and written on with names and PDGA numbers when it, in fact, detracts from the course’s natural beauty. Sometimes we don’t quite realize the impact we can have on our local disc golf course. Even smaller actions like trampling through the rough will, over time, change the nature and layout of each hole. While that’s a small example that happens after years of wear and tear, other players tend to take matters into their own hands in a more serious way. If you’ve ever seen someone breaking branches or in some cases literally cutting down trees with a handsaw, then you’ve been privy to some of the worst course etiquette imaginable. Unless you are tasked with maintaining a course or are helping out with a work party, there is no reason to alter a hole just because you don’t like the trees in the way. At the end of the day, there’s something to be said for the disc golf karma that’s in all of our lives. As long as we’re respectful and good to the courses we play on, the game keeps on giving back to us in countless ways. If you see someone exhibiting poor course etiquette, do you call them out? Let us know how you’d handle it in the comments below! If I see players OR other users of the area littering, I have no problem walking to them and tell them that they "dropped something" and kindly pick it up and hand it back to them. Golden Rule rules. Do unto courses . . . bla bla bla. I always carry a trash bag and sometimes I have to use it. These are all good suggestions. But what we do to our courses is not our greatest etiquette challenge. When we throw on non-players, (or build courses that make safety an inevitable problem) we risk having courses closed, sometimes for good reason. Respect is a core value to all of life, not just within our game. Safety as a concept is relative and subjective. If we build a course that has less physical risks than the other local courses, but still poses risks that exceed walking on a level sidewalk are we to be guilty of some design sin? Isn't some inherent risk inevitable in any sport? And who deems a course designer or club guilty of being detrimental to the sport of disc golf, as if we were blasphemous of a religion or cult? Make sure your course isn't worse or more dangerous than its peer local courses and start throwing!